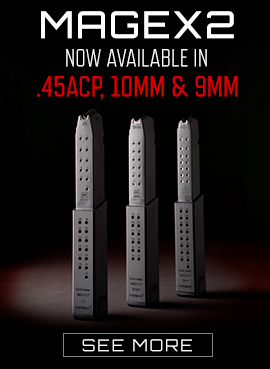 The KRISS Mag-Ex Kit 2 is the ultimate capacity extending base plate for your factory standard Glock magazines. The KRISS Mag-Ex Kit 2 is made up of the extended baseplate, outer sleeve, and extended spring, constructed of durable and lightweight reinforced composites. Combining the Mag-Ex Kit 2 with the factory standard Glock magazine body and follower is a perfect match of reliable feeding, toughness, and aesthetics for the KRISS Vector. The Mag-Ex Kit 2 is available in 9mm and 10mm and designed for standard capacity G17 and G20 magazines for an overall capacity of 40 rounds of 9mm and 33 rounds of 10mm for your KRISS Vector, Glock handgun, and your Glock magazine-compatible pistol caliber carbine. Please Note: You are responsible to know and comply with your state and local magazine capacity laws. A 15% restocking fee will be applied to any returned or undeliverable magazine order. This item cannot be shipped to states with magazine capacity restrictions. Note: Mag-Ex2 Kit is designed for factory GLOCK full size, standard capacity magazines of the correct model. 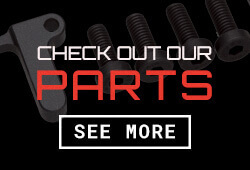 We do not guarantee fit nor function when using aftermarket magazines or incorrect magazine models. Mine just arrive yesterday! They go together so simple and look great on my Kriss CRB.! Headed to range this weekend..so excited! !